Please Select Height: No height selected 32" 33" 34" 35" 36" 37" 38"
The shoulder vise is a chain-drive twin-screw vise, with 12" spacing between the screws, 8-1/4" of travel, and a 22-1/2" maple jaw. The rugged tail vise has 6-7" of travel and a non-traditional “no L-block” jaw. The front stretcher is 4-1/8" wide and flush to the front of the legs and benchtop. Trestle legs are 3" square and flush with the front of the bench. No skirt, no tool tray, just plenty of clamping surface. 4" thick solid Hard Maple top. 7 feet long (including tail vise handle) x 2 feet wide (excluding the shoulder vise). Bench height is customizable between 32" and 38". Click here to view our YouTube video on The Lie-Nielsen Workbench with Christopher Schwarz. A workbench is one of the most important tools in the shop and needs to be flat, stable and heavy. 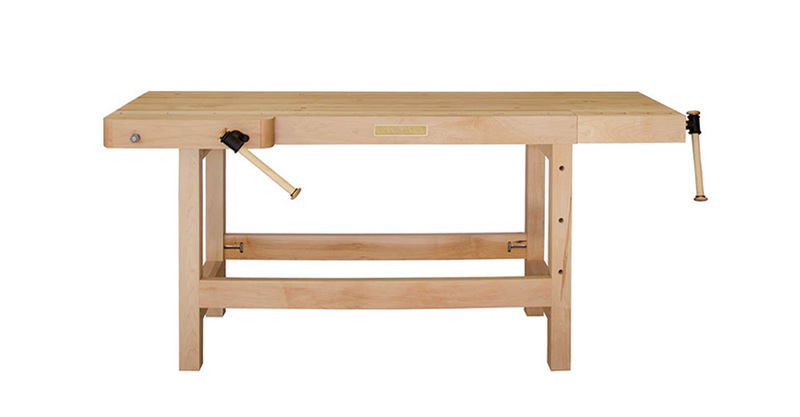 Lie-Nielsen Workbenches feature simple design and solid construction. Our benches come equipped with two rugged vises: our Chain-Drive Shoulder Vise, with 8" of travel, and our non-traditional, “no L-block” Tail Vise, with 6½" of travel. Bench dog holes are along front edge. Dog holes are 1.150" x .950". Holdfast holes along front right leg and benchtop for a variety of work-holding options. Holdfast holes are ¾" diameter. Benches are supplied with two vise handles and two wooden square bench dogs. Click here to download our Lie-Nielsen Holdfast Hole Layout Diagram. Most benches currently on the market are approximately 35" (88.9cm) high. 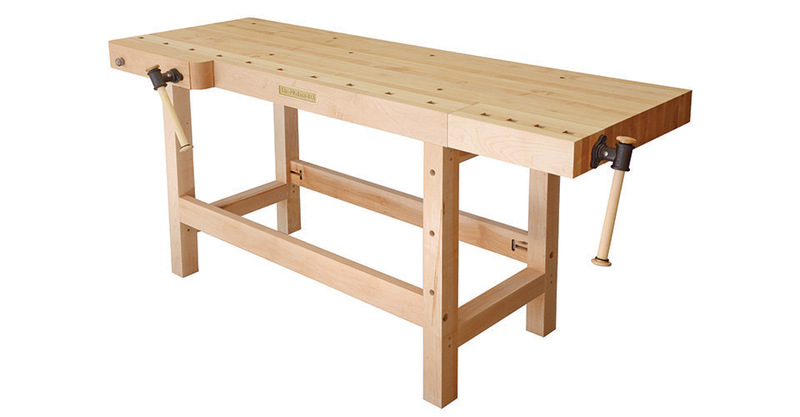 For many modern hand tool woodworkers, a taller bench is more comfortable. We can customize the height of a workbench between 32" (81.28cm) to 38" (96.52cm) high. The Tail Vise and Chain Drive Vise can be positioned on the bench to accommodate either a right-handed or left-handed orientation. Lie-Nielsen Workbenches feature simple design and solid construction. No skirt, no tool tray, just plenty of clamping surface. They are made of Hard Maple, a native hardwood that is stable, heavy and tough. Bench tops are 4" thick solid Maple, machined flat within a tolerance of plus or minus .010". We recommend you reflatten the top as needed, every year or two. The trestle is secured with drawbored mortise and tenon joints. Lie-Nielsen benches are finished with a 3 equal-part mixture of spar-varnish, boiled linseed oil and mineral spirits. This traditional finish seals the wood, but does not make it slippery. The finish will need to be renewed from time to time. Wooden Hand Screw Clamp 10"